The Lent Madness Emporium. Or Lentorium. 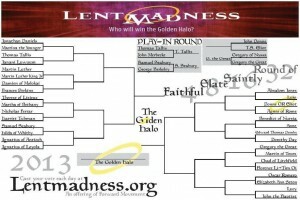 Lent Madness isn’t just about saints, discipleship, voting, formation, and chuckles. Like the rest of our culture, it’s about commerce. So here’s your chance to stock up on Lent Madness goodies. First of all, you can’t tell the players without a program. 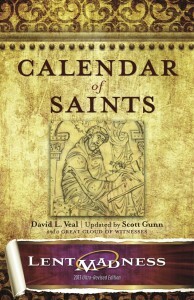 Get thee to the Kindle or Nook stores and buy a copy of Calendar of Saints: Lent Madness 2013 Ultra-Revised Edition. This venerable title began life as book of devotional essays on the saints by Canon David Veal. Last year, we revised and updated it to include all the official saints of the Episcopal Church calendar (none of the trial use clutter) PLUS all the saints in Lent Madness. 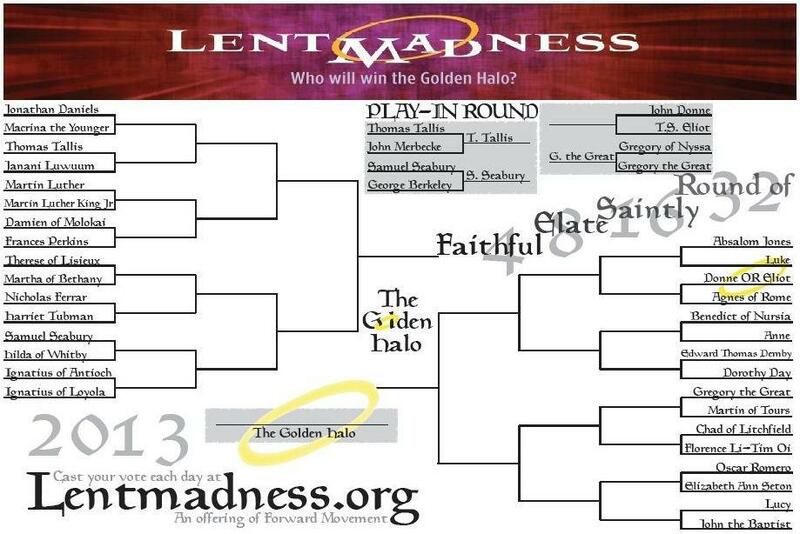 This year, it has been Ultra Revised to include all the saints in Lent Madness 2013. Besides author David Veal and editor Scott Gunn, this year’s contributors include several celebrity bloggers and Lent Madness luminaries: Laurie Brock, Megan Castellan, Penny Nash, Tim Schenck, Heidi Shott, and David Sibley. Janet Buening on the Forward Movement staff added an essay and pulled the whole thing together. So, anyway, there’s lots of great stuff here — it’s a devotionally oriented look at the saints. Second of all, since you are probably a bit sleepy after thinking about books, you are going to want a shiny new coffee mug. If you insist, it can hold other beverages too, up to eleven ounces. 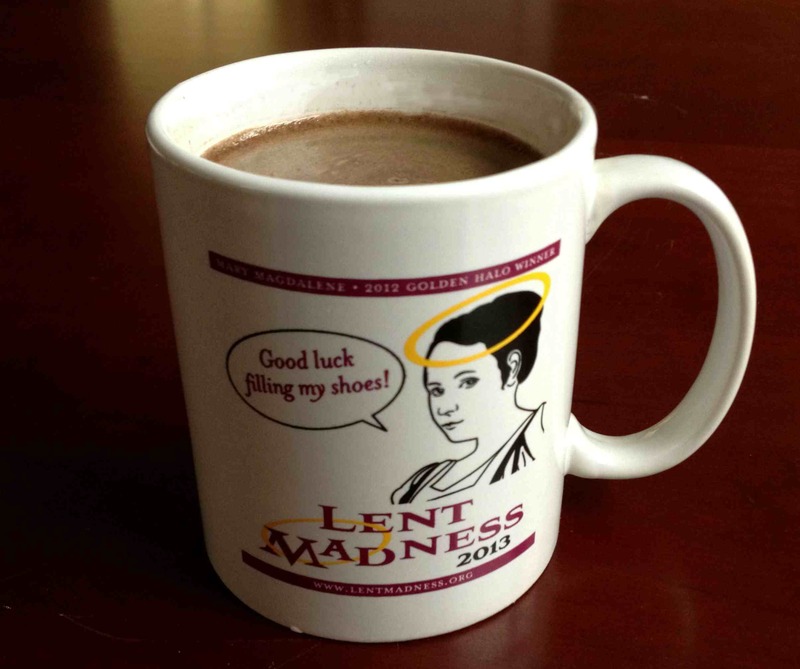 This year’s mug features the Lent Madness 2013 logo, as well as the reigning Golden Halo title holder, Mary Magdalene, with a word to this year’s bracket of saints: “Good luck filling my shoes!” Buy your mug for the low bargain price of $10 from Forward Movement. Get another one (or ten more) and the price plunges to nine bucks. Third of all, and finally, you are going to want to track the results of Lent Madness in real time on your living room wall, right? For this you’ll need a giant, poster-sized bracket. We have just the thing. New this year, you can buy yourself a 36″ by 24″ full-color bracket to record the winners of each match. Brackets are just ten bucks, or two for $18. Buy one for your parish hall bulletin board, another for home, and perhaps a third for work. It would not be completely out of line to get one for the car and several for your neighbors. Keep an eye on the Store page. If we think up more stuff, we’ll put it there. Got an idea for something you want to own? Let the Supreme Executive Committee know your ideas. Buying all this stuff supports the work of Forward Movement, and here’s a promise: If we sell at least $10 million of merchandise this year, we’ll seriously consider getting a purple Lent Madness blimp for next year. Whoever buys the most stuff (minimum purchase, $1 million) can have a free ride on the official blimp with the SEC. Hey, it could happen. Or not. 15 Comments to "The Lent Madness Emporium. Or Lentorium." When are you going to start making your own Saintly kitsch to sell? You know, like a waterskiing Mary Magdalene that also serves as a napkin holder or something like that. You’re right, Mary. We need a Lent Madness sweat shop to produce cheap saintly kitsch at a huge profit margin. Injustice and exploitation = no way. Say, SEC, what sort of working conditions are you offering the Celebrity Bloggers, anyways? Yeah, what kind of working conditions are we working under anyway? Hey, you are getting paid in mugs & brackets. Sounds like excellent working conditions to me. Don’t forget the undying respect of the entire Episcopal church community because we are CELEBRITY BLOGGERS! We should get sashes that say that to wear to Episcopal events. Laurie, I originally thought you said ‘ashes to wear…’ and I did a double-take, but then I thought “Well, it IS Lent.” Maybe you could write it in ashes on a t-shirt…(Made in the US of course, don’t want to get myself in any more trouble). Ok, what about Made in America or by some sustainable community saintly kitsch? Mary Magdalene waterskiing napkin holder knit or crochet patterns (after all, if they can make shark socks, why not?) or made from coconut shells by some South American community in need? 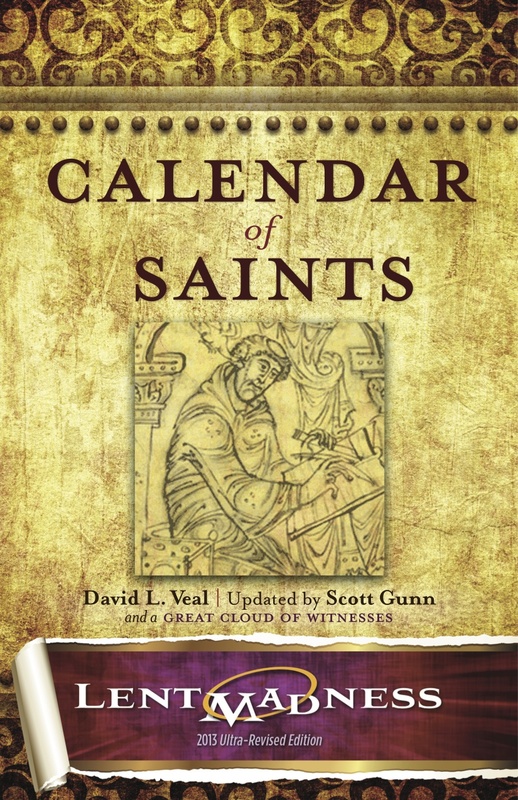 I have the Calendar of Saints , 2012 edition. Anyway to have the parts of 2013 not in 2012 available? Just wondering. We’ve gone through the whole book and fixed a few “issues” we found here and there. So it’s not just the ten or so new saints that you’re getting. Alas, we don’t have a way to just sell the new bits, but we did SLASH the price to only $4.99. But, really, if you have last year’s book, there’s not TOO much that’s new. You could skip a year and rejoin the throngs next year. LOVE this post!!! I’m going to order mugs right away. Do I really have to copy the Kindle edition of Calendar of Saints?? Well, we’re not publishing a paper version. So if you need a paper book, I’m afraid it’s the copier for you. Seriously, we may publish a whole new saint book (in paper and ebook) next year. Wait until then if your heart is set on paper. My heart is not so much set on paper as on not buying a kindle or nook. Anyway to sell on i-tunes or something? What can be more maddening than Lent Madness kitsch. However if we are to go down tis road here are a few suggestions. Perhaps a nightlight with an image of Thomas Cramner? What could be more comforting for those lost in the darkness, perhaps on the way to the bathroom, to have the path illuminated by something like this. An item for those of us who will undoubtedly see their brackets quickly eliminated and seeking comfort in adult beverages a set of wine glasses with an image of St. Amand, patron saint of wine. Sure he is only recognized by the Catholic and Eastern Orthodox churches but isn’t Lent Madness truly worldwide and ecumenical. Finally for those with the same problem described above but with a smaller budget a set of beer mugs featuring one of this year’s competitors. St. Luke, for reasons not clearly understood, is considered by many as the Patron Saint of beer and brewers. Also is it coincidence that the proposed blimp is to be purple, the team colors of the Baltimore Ravens. Have the saints foretold the outcome of the upcoming Super Bowl? I know you have considered the T-shirt angle. So maybe this has been considered and trashed or considered and in process. My suggestion is that you take prepaid pre-orders for t-shirts that will feature the portrait(?) of and maybe a quote from the 2013 Golden Halo winner, whoever it will be, and maybe list prior winners. Then you could get a clear idea of how many to manufacture. I’m with Mary W: I’m enough of a Luddite, and I am “wired” enough thank you very much, that I don’t and won’t be investing in a Nook or Kindle. How about selling it in a PDF version? Heaven is aware that I don’t know much about the saints, so I really need to study up!